Realistic Physics Mod v7.0 | Best Version! • Physics settings have been entered more realistic for all trucks. • Cabin’s inside shake has been set more realistic. • Braking power is back to its original regulation. • Gearbox settings of v1.4.1 were made. • There isn’t any new gearbox option. Default game gearbox is used. • Driving is more realistic now in rainy and sunny weather. • The gearbox settings weren’t touched. They are the original ones. 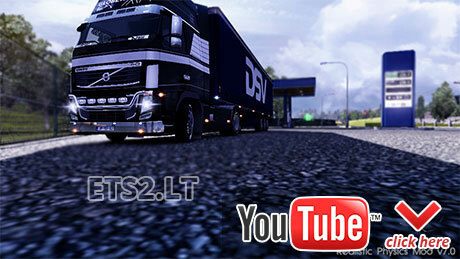 • This mod just changes the suspension settings. 11 Responses to Realistic Physics Mod v7.0 | Best Version! with speed limiter link down please fix. Here’s the original link for the version with the limiter provided by the poster. OK its almost perfect, you could make the front wheels suspension more farm this one look like old trucks 70’s and the cab suspension is OK about the back suspension keep it original these have to support the trailer so need to be farm and strong, thank you again for your long work. impressive !! is this work with the 1.3.1???? i have the last update too but i still play with the 1.3.1 version cause i use trucksim map v3.0!! Finaly I can drive 70/90 km/h (with cruise control), its just a pety that we must use the default game gearbox (Scania) and lose the GRSO925 12+2 speed R, was a good gearbox just had that problem with cruise control and stock between gears, well we can’t have it all. Like the cab suspension its much better that the last one and like EVOX said, the back suspension needs to be more farm. Thank you for this update and your work. v1.4.1 has an option to turn the speed limiter on or off. So why two versions? Their is 2 mods so people that hasn’t updated to v1.4.1 can still use the mod some people are still using v1.3.1 for the map mods ontil they work with the latest update. Thanks for this update and your work it works grate the back suspension needs to be stiffer but other then that its a grate mod keep up the good work. Because some people have mods which are still incompatible with v1.4.1. So it’s wise to have these speed limiter versions up for older patches as well. le terrain d’essai ce trouve où ?